The Challenges Of Child Care: Emotional Decisions And A Constant Juggling Act : The Baby Project A group of parents (and one grandparent) gathered at NPR's headquarters to talk with Michele Norris about the logistical and emotional challenges of child care. As families prepare to welcome babies into their lives, one topic that inevitably has to be sorted out is child care. Whether or not parents work outside the home, at some point they will have to turn to someone else to help watch their children. Will it be in a day care center or at home? Will a family hire a nanny or share a babysitter? And then, course, how will each family pay for it? 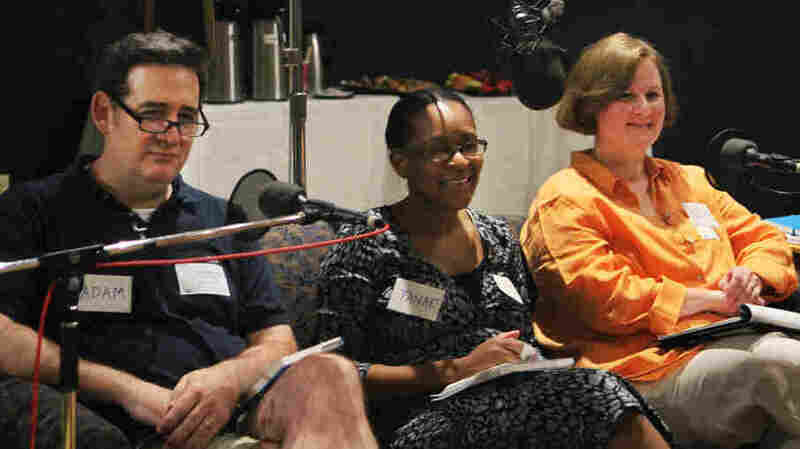 To dive into this issue, All Things Considered co-host Michele Norris gathered a group of parents (and one grandparent) at NPR's headquarters to talk about the logistical and emotional challenges of child care. (The conversation airs tonight on All Things Considered). All of them are from the Washington, D.C., area, where the cost of living is quite high. Sharon Johnson takes care of her 3-year-old grandson while his parents work. Angela Tilghman is a single mom who works long hours. After ups and downs with several day care providers, a lifelong friend now cares for her son, who has special needs. Kelly Hruska has a 7-year-old daughter and a husband on active duty in the Navy. Tanae Foglia has 4 1/2-month-old twins. She and her husband work in downtown D.C. and an au pair cares for the babies. Adam Graham, a former stay-at-home dad, now works as a high school teacher. He and his wife have two daughters, ages 14 and 9. Stacy Ferguson is a lawyer for the federal government who says she's had every kind of child care imaginable for her three kids. The group talked about how to deal with the inevitable complications parents face when working outside the home — the scramble for backup caretakers, unplanned business trips, sick children. Ferguson says she called herself the "worst mother in the world" when she dropped her sick daughter off at camp recently. "But I had to go to work," she says. Stacey Ferguson talks about taking her sick kid to camp. And once at their jobs, the parents say they don't want others to know how much juggling goes into their home lives. So they don't talk about how difficult and scary it is. Driscoll says she left her job as an attorney in 2007 because she felt like she would have no support from her employer when she had a family. A male partner even told her she couldn't "do both." Corie Driscoll explains why she left her job as an attorney. And for those who stay in their jobs, there's the risk of discomfort or guilt that their children could get closer to someone else. "I spend maybe about 10 to 12 hours a day away from my child," says Tilghman. But she says she finds comfort in the fact that someone else cares about her child. Angela Tilghman describes the comfort she feels that her son is in good hands. The group had a lot more to say — the full audio of the conversation on All Things Considered will be available at the top of this post. What's clear is that whether you stay at home or work outside it, there's guilt, exhaustion and many decisions to be made. What thoughts do you have about the juggling act? Share your story in the comments. Part 2 of this conversation — the dollars and cents of childcare and advice from the in-house group — will air tomorrow on All Things Considered.